Seeing the smiles on everyone's face at the end of a fun filled Saturday, coupled with words of affirmation from the refugee students about how inspired they were to pursue their education in the future, made the Monash team very happy - knowing that we've planted seeds that will grow in the hearts of these youth. Education is a right that all of us are entitled to. One that promotes individual freedom and empowerment, developing young minds that are brimming with potential. Like all children, refugee children have the fundamental right to education, with organizations like UNCHR, Dignity for Children and The Fugee School playing instrumental roles in providing refugees access to education. 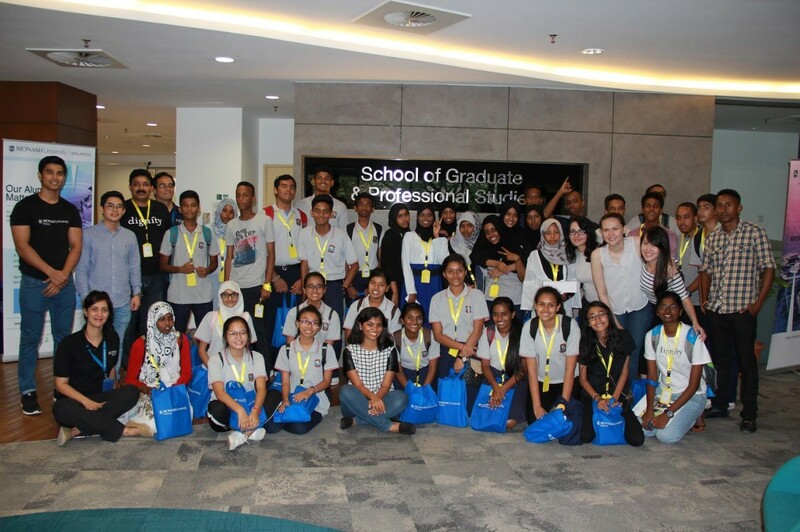 The Monash Malaysia Business Alumni Chapter (MMBAC) team, supported by Monash University saw the need to inspire refugee youths who are equipped with secondary school level education to expand their horizons, and to set their eyes on pursuing a degree. We designed a program for the youths, that coincides with Monash's open day, fondly known as "Discover Monash" - giving them a chance to experience Monash University at its liveliest state; with university students buzzing with excitement, having booths from each school, club, and even performances! We're truly blessed to have a team who is so passionate about the same cause. We spent our Saturday - the 18th of March 2017, with youths from Dignity for Children, The Fugee School, CERTE Malaysia and The Picha Project. This event is parked under the "Community" pillar, one the three pillars that our activities are centered around. Our day was packed with exciting events, which started with an educational game about human rights by Ms Priya Sharma, to a very inspiring sharing. Our very own Prince from Monash who has a refugee background, shared an inspirational message with the youths. Needless to say, the youths were inspired and hungry to know more - which could be seen through the avalanche of questions that he was receiving from the crowd! Subsequently, all volunteers brought the youths around Monash for a tour, and to play games around the campus. When it was time to finally say our goodbyes, the students thanked us for the very meaningful day, and shared how inspired they were to pursue their tertiary education (with Monash being their dream university, of course!). Some of us from MMBAC even received messages from the refugees after the event, thanking us for this experience. While others discovered Monash that Saturday, these youth discovered their newfound dreams. We strongly encourage other universities to organize events similar to this, as the benefits are reaped by both parties: Inspiring and spurring refugees to develop - achieving their potential, and for us volunteers; immense satisfaction and happiness, knowing that we've made a difference in their lives. If you're a Monash alumni, and have a passion for serving the community, do join us for our upcoming events, or reach out to us if you'd like to initiate your own activity under our 3 pillars - Social, Community and Development. Signing off, Charis Wong - MMBAC’s Head of Strategy.